Published on April 3, 2018 . Reductive summary of claims: Positive impacts of direct cash transfers attenuate considerably over time. Negative spillover effects for non-recipients are substantial. Comparing recipients households to non-recipients in distant villages, we find that recipients of cash transfers have 40% more assets than control households three years post transfer. This amount (USD 422 PPP) is equivalent to 60% of the initial transfer (USD 709 PPP). However, we do not find statistically significant across-village treatment effects on other outcomes. This difference could stem … from potential spillover effects at the village level. Indeed, non-recipient households in treatment villages show differences to pure control households on several dimensions. The point estimates suggest spillover households spend USD 30 PPP less than pure control households, or about 16% based on a pure control mean of USD 188 PPP, and score ~0.25 SD less on an index of food security than pure control households. Spillover households also score ˜0.18 SD less on an index of psychological wellbeing than pure control households. The magnitude of the income gains of the “best you can do” via direct interventions to raise the income of the poor in situ is about 40 times smaller than the income gain from allowing people from those same poor countries to work in a high productivity country like the USA. Simply allowing more labor mobility holds vastly more promise for reducing poverty than anything else on the development agenda. Overall, I think the essay doesn’t do much to support the titular claim. The closest it gets is a couple paragraphs in the middle stating, “The industry exploits complex, sentient beings as resources, which is a woefully inefficient process.” I’d certainly be interested in hearing a more compelling argument on this topic (i.e. animal welfare arguments that are justified solely in terms of benefits to homo sapiens). Pointers? when comparing actual outcomes to value estimates, we should expect to be disappointed on average, not because of any inherent bias in the estimates themselves, but because of the optimization-based selection process. 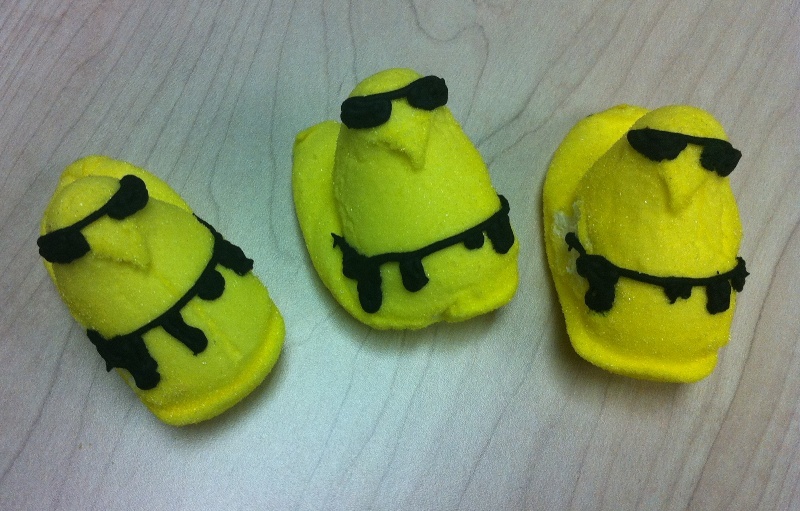 Peeps resent their tortured existence. But this Easter, they have a plan to end their misery once and for all. They’ll travel back in time to the eve of Jesus’s crucifixion and gear up to stop it. No crucifixion, no resurrection, no Easter, no Peeps. Like 300, but more biblical.